If your dog requires surgery, you might be as concerned about the effects of anesthesia as about the actual operation. Most dogs recover easily from anesthesia, with minor aftereffects. However, the majority of anesthesia-related deaths occur during recovery, within three hours of the surgery. Your veterinarian won't release your dog to you before that time. Once your best pal is home, keep an eye on him and make him comfortable. Dog getting an anesthetic injection. Drowsiness for a day or two after anesthesia is common, although some dogs are alert by the time they leave the veterinary facility. Your veterinarian will advise you about when and how much to feed your pet. If the operation didn't involve his gastrointestinal system, your dog will likely return to his normal feeding schedule by the day after surgery. If your dog still appears sleepy and disoriented after 48 hours at home, call your veterinarian. If he's really out of it and you can't rouse him, call your vet immediately. If you own a brachycephalic, or short-nosed, breed (such as a bulldog, boxer, pug or Pekingese) the veterinarian will take special precautions during and after surgery. The anatomical structure of the head and airways make these breeds prone to respiratory problems, and can cause anesthesia complications. After surgery on such breeds, the breathing tube isn't removed until the dog is fully awake. This ensures the dog has no trouble breathing. Fortunately, brachycephalic breeds don't face additional risks after this. How Long Does Dog Neutering Take? 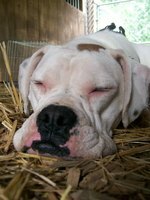 What Happens If a Dog Breathes Hard When Sleeping? How Do They Neuter Dogs?